Help - I Have "Laptop Pain"! There you are working at your desk and your back starts to hurt. So you sit up “straight” and after just a few minutes you are in pain and so you hunch over again and that doesn’t work either. This is “computer posture”! This hunched over pattern can become so entrenched that even when you are standing up you might feel and be hunched over. No amount of pulling yourself upwards or collapsing downwards into relaxation offers a SUSTAINABLE solution. So what to do? 1. Lie down on the floor (it has to be the floor not the bed) with a book under your head. Bend your knees and place your feet a comfortable distance apart on the floor. Arms should be bent at the elbows with hands resting on the abdomen. 2. Allow the weight of your entire body to surrender and give in to gravity. ALLOW your body to spread. Be content, stay awhile. Lie down often. 3. Do not push the body downward in any place, thinking that by doing so you are helping your body release. Lying down itself lessens the tightness and pain in the body. In fact the very reason the pain diminishes is because the head, neck, and back are allowed to revert to their natural alignment. Best of all study the Alexander Technique and learn how to work pain free at your laptop!!! When students come to the Alexander Technique to deal with pain they are experiencing, that pain can come from many different sources, i.e. lingering effects of trauma, chronic pain from mis-use or a congenital condition. Oftentimes the student is faced with pain that persists even after steps have been taken to correct misuse or an injury has healed. It is not uncommon that when working with such a student at the chair, the act of sitting can set off the student’s pain. 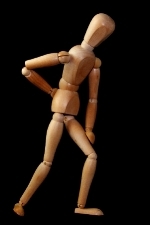 This pain might be anywhere, the joints of the legs, the back, the neck, even the (seemingly unrelated) shoulders. When the pain occurs, the student reacts to the pain by tightening in protection, as is only natural. Except that is not usually the order of events. Because the student begins the activity with the knowledge that pain is coming, they preemptively tighten the musculature as a protective measure. While immobilizing an injured joint might be a good thing, particularly in immediate response to trauma (after all, this is why slings and casts exist), this is a very different situation. The student has chosen to move, and tension, the bracing that occurs as a way to protect against pain and discomfort compromises the movement, thus becoming the cause of the pain. As an example: A student complains of knee pain when sitting. They can be observed to tighten the muscles of the legs when they start to sit, particularly the quadriceps. This is because they don’t want to “lose control” of the knee, or are gingerly “feeling their way” through the movement. But sitting requires that the quadriceps are free and able to lengthen. The protective habit of tension in the quadriceps works directly against the means required to seat oneself. 1) The student enters a state of (one of Alexander’s favorite terms) mal-coordination. The knees are no longer working in harmony with the rest of the joints and the inclination of the torso, as a result . . .
2) The student’s balance is compromised. Sitting works when the joints of the leg and the movement of the torso are free to work together, maintaining a stable balance through free interplay of movement. Once a joint is no longer free, that free interplay is blocked and something else has to happen to maintain balance, at which point . . .
3) Something Else Happens. This will vary by student, but if they are not in balance, they have to do something to stay on their feet. Something that is otherwise unnecessary, in addition to the inevitable tightening of the neck. It is a pretty easy guess that this will involve more tension and stress on the joints they are trying to protect rather than less. Each of these factors can result in pain. Tightening puts greater strain on the joint than necessary. Imbalance produces additional sheer forces on the joint. Mal-coordination slows the action, leaving the joint under stress longer than required. Therefore, because the student responds to the pain before it has occurred, the knee hurts. The anticipation of pain creates the pain. This the same general scenario plays out with pain in other areas of the body or other activities. The Alexander Technique offers the student a chance to return to a state of coordination and balance that reduces the strain on the joints and allows movement to flow. Some students are aware enough that when the anticipatory response is pointed out to them, they can change it. Simply asking them to “Try not to anticipate pain,” or “Try moving as though you aren’t in pain,” will be enough to change the process of the activity. Other students require a strong reminder that they need to keep the neck free, as the anticipation of pain usually starts with tension in the head/neck/back relationship. For other students, the whispered “ah” can help keep them breathing and short-circuit the habits of tension. The fact is, the student’s perception of what is necessary to complete the action is compromised. But getting the student to inhibit and direct affords them the opportunity to flow through the activity in a new way, and be surprised by what the process truly requires. And the best surprise is when pain is no longer part of the activity.